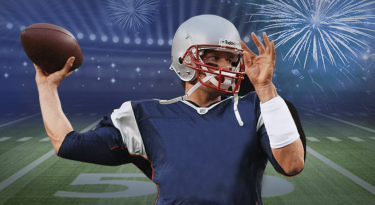 7 Tips For Throwing A Knockout Super Bowl Party 0 out of 5 based on 0 ratings. 0 user reviews. Super Bowl Sunday is just days away! As the Pats and the Falcons get ready to battle for the Lombardi in Houston, most of us at home are starting to plan a night filled with friends, football and way too much food. If you, like many Americans, will be hosting the Big Game party this year, we figure you can probably use some pointers. After all, come February 5th your living room will be packed with guests huddled around your tv, shoveling down potato chips like calories don’t count and flushing down booze like there was no tomorrow. Want to start planning to make sure your party is a big hit? Follow these 7 easy steps and your party will win big on Game Day! Warning: Following this guide may make you the default Super Bowl host for years to come. 1. Make a List and Spread the Word! Write a concise, funky message. Include the address and time of the event. …as long as everyone can sit comfortably with a clear shot of the TV. Don’t invite 100 people if your living-room can only fit 10. You really don’t want your guests crammed in like sardines. Who Should You (Not) Invite? While you may be tempted to invite that friend whom you haven’t seen in years, your Super Bowl party is not the time to catch up on the last decade of your life or to reminisce about your 6th grade teacher. Refrain! Instead, invite him to meet you for a cup of coffee or a beer on another night. About a week before the big day, get a good estimate of the number of people who will actually show up. This will help you stock up on food and drinks. Don’t be shy to ask each friend to bring something. Your guests will be grateful to know they can help out. By telling them what you need, they won’t have to resort to guessing what will be most useful. This will save you the risk of ending up with 10 bags of Doritos and nothing to drink. Make sure your apartment or house is clean and welcoming when your guests arrive. If your place is a dump, or you’re still cleaning when they get there, it will totally put a damper on the party atmosphere! Have some friends you can really count on? Ask them to help you get your place set up for the party. Throw on some good tunes to get you in the mood and grab a mop! (We promise not to judge if you start drinking while you clean.) If you’re short on time, at least make sure that the living-room and bathroom are clean and close all the other doors. Set up your living room so it’s ready for a crowd. Take out any unnecessary clutter and make sure all of the chairs and sofas are facing the TV screen. Lay out food and drinks around the room so your guests can snack easily, regardless of where they are sitting. They’ll want to nibble all night long, without having to move their bums! Are you a neat freak? Then be sure to place some trash bags around the living room so your guests will know where to throw their empties. Are you the competitive type? You can divide your living room into two camps, with decorations on each side to match each team’s colors. Bonus: This way you can learn who your real friends are, based on who chooses to sit on your team’s side! 4. Get Your Hands Dirty! Since you want to throw a truly epic party ever, so naturally you’re going to need some amazing food. No Super Bowl party would be complete without some tasty finger-lickin’ snacks to enjoy during the game. Especially since watching football makes people hungry. With all that running and sweating, your guests will be shoveling food into their mouths from the moment they arrive. What Should You Feed Those Hungry Guests? The Super Bowl only occurs once a year, so don’t hold back! Buy, bake or beg a wide array of snacks and appetizers and lay them out for easy access. Make sure all of the food is finger-friendly. Nobody wants to deal with forks and knives when they’re busy screaming and gesturing at their team with a beer in their hands. Think chips, dips, wings, pizza and ribs. Feeling healthy? Try crudite – or avocados! Want to use this occasion to show off your cooking skills to your friends and family? Check out our Top 5 Appetizers and Dessert Recipes for some easy and delicious recipe inspiration. If you’re feeling creative, you can try these 9 Football-Shaped Super Bowl Snacks for a real themed party! Over the past 50 years, the Super Bowl has grown from a simple gathering of friends to a full-fledged American tradition. Super Bowl Sunday is America’s second biggest food day. And like all good traditions, with good food comes…good beer. As we all know, football is a sport that begs for nothing else but beer! Not much ruins a party like running out of booze, and you certainly don’t want to have to make a beer run during a great play, so be sure to stock up on the beverages! With all of those beer commercials bombarding your guests, they’ll be working up a strong thirst for the suds. So pack your fridge(s) with lots of 6 packs and consider buying a keg – there’s no bigger crowd-pleaser than an endless flow of beer on tap! Have some heavy-drinking friends? Don’t be shy about asking them to BYOB. Buying enough beer to satisfy a bunch of beer-happy guests throughout the night can get pretty costly! Pro Tip: Don’t forget water and soft drinks for kids and designated drivers. Super Bowl parties are mostly about watching the game with family and friends while munching on some deliciously unhealthy food, washed down with some nice, cold beer. Simple decorations can be a great way to get everyone into the Super Bowl spirit. You’d be surprised the difference that little things make. Setting the tone for the evening makes the experience much more fun! Try buying decoration in your team’s colors or throw in some football props to make your living room feel just like the sidelines. You have unlimited options. You can put up banners of the two competing teams on your wall or hang streamers with the teams’ colors. 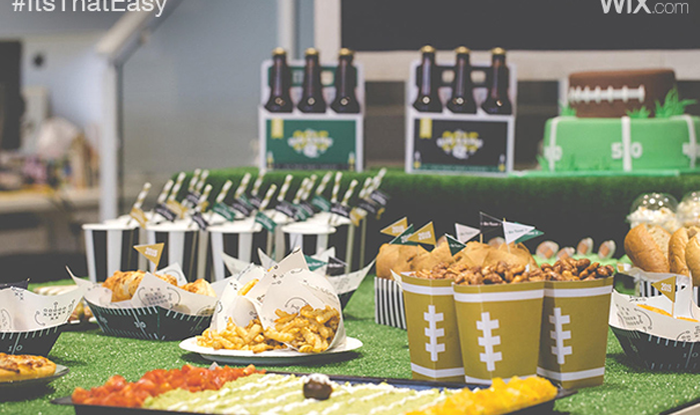 Or transform your Super Bowl party snack table into a mini football field dotted with football-shaped trays and bowls. The Super Bowl is all about having fun, so decorating is important! Be creative and bring the atmosphere of NRG Stadium into your living-room! Who says that football players should have all the fun on Super Bowl Sunday? 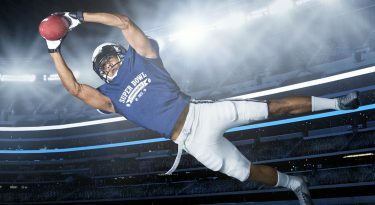 To take your Super Bowl party to the next level, plan a few activities to entertain your guests during halftime or before the game starts. Spicing up your party with some games will ensure that even if The Game is a bore, your party will rock! For the commercial enthusiasts, invite your guests to keep track of their favorite commercials with a game of Super Bowl ad Bingo. Print out game cards and hand them to your guests. After the game, you can swap thoughts on your favorite commercials. 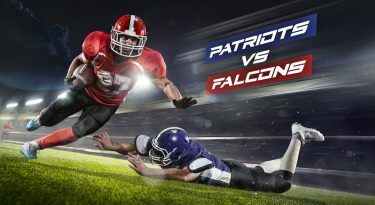 If you are still feeling a bit nervous about hosting the Super Bowl party, check the helpful video below and make sure to avoid making the same mistakes! And if the game is really lame, you can just watch the commercials, right here!